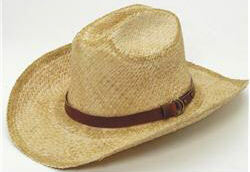 Natural Western Straw Hat. Ideal for full sun protection while gardening or working outdoors. Shades your face and head area. Made from natural material with classic style. Universal sizing. Weight adjusted for packing box & materials.